Be the first to share your favorite memory, photo or story of Deloris. This memorial page is dedicated for family, friends and future generations to celebrate the life of their loved one. 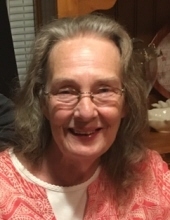 Deloris Stiltner Yates 65 years of age of Haysi, VA passed away Friday, February 15, 2019 in the Holston Valley Medical Center, Kingsport, TN. Born November 8, 1953 she was the daughter of the late Arnold Stiltner and Helen Looney Stiltner. Deloris was a member of the Russell Prater Old Regular Baptist Church. She like working in her flower garden and reading. Most of all she loved spending time with her grandson Carson and helping others. In addition to her parents she was preceded in death by her sister, Lucille Stiltner; brother, Ronnie “Harry” Stiltner; brothers-in-law, Tex Stiltner, Donnie Sullivan, Danny Scammell; father and mother-in-law, Earl and Ruby Yates. She is survived by her loving husband of 46 years, Randolph Yates of Haysi, VA; daughter, Tessa (Chad) Deel of Vansant, VA; sisters, Elsie Sullivan, Jean Stiltner, Rose Scammell all of Harman, VA; brothers, Frank Stiltner, Grover (Debbie) Stiltner, Larry (Wanda) Stiltner, Eddie (Ann) Stiltner all of Harman, VA and her grandson, Carson Deel of Vansant, VA.
She was also survived by her sister-in-law Diane (Randy) Lane of Vansant, VA; brothers-in-law, Benny (Lynn) Yates of Haysi, VA and a host of very special nieces, nephews, friends and brothers and sisters in Christ. Funeral services for Deloris Stiltner Yates will be conducted Wednesday, February 20, 2019 at 11:00 a.m. at the Russell Prater Old Regular Baptist Church on Greenbrier, Haysi, VA with Elders: Roger Coleman, Mark Justice and Lloyd "Popeye" Brown and Rick Mullins officiating. Burial will follow in the Compton Cemetery on Right Fork of Greenbrier, Haysi, VA. Active pallbearers will be: Chad Deel, Carson Deel and Nephews. Honorary pallbearers will be: Frank Stiltner, Grover Stiltner, Eddie Stiltner, Larry Stiltner, Benny Yates, Randy Lane and the CICU Nursing Staff of Holston Valley Medical Center, Kingsport, TN. The family will receive friends at the Russell Prater Old Regular Baptist Church after 6:00 p.m. Monday. Evening services will be held Monday and Tuesday at 7:00 p.m. The family of Deloris Stiltner Yates have entrusted the care of there loved one to Shortridge-Ramey Funeral Home of Grundy, VA.
"Email Address" would like to share the life celebration of Deloris Stiltner Yates. Click on the "link" to go to share a favorite memory or leave a condolence message for the family.